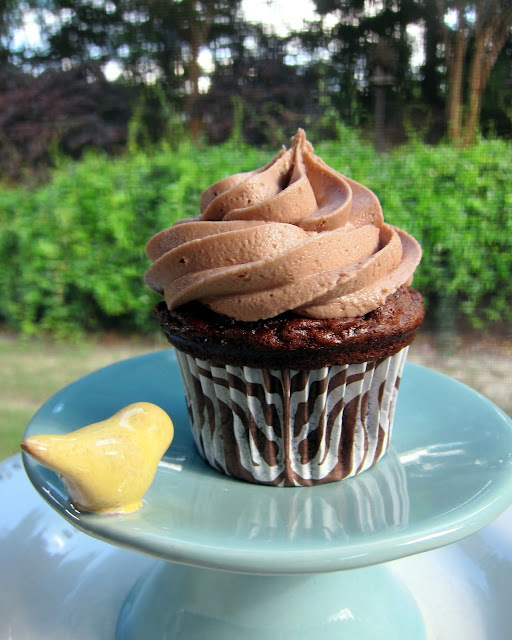 Run, don't walk, to the grocery store and pick up the ingredients for these cupcakes! Not only are they super easy to make, they are incredibly delicious. The cake is soft and moist, and the icing is perfectly chocolatey without being overly sweet. Chicken Legs declared this the best cupcake ever. He liked it better than the Biscoff version. I took these to work and they were gone in no time. Give these a try. I promise they are worth every single calorie. Line 2 muffin pans with cupcake liners. Set aside. In a large bowl, combine 1/2 cup Nutella spread and the stick of butter. Beat at medium speed with a hand-held mixer until light and fluffy. Add eggs one at time, mixing well after each addition. Add cake mix and water. Mix on medium-high speed for 2 minutes. Divide batter between muffin cups (I use an ice cream scoop). Bake for 18-20 minutes. Allow to cool completely before frosting with Nutella Buttercream. In the bowl of an electric mixer fitted with the paddle attachment, cream butter and Nutella spread until smooth and creamy, 2 to 3 minutes. With mixer on low speed, add 6 cups sugar, whipping cream; mix until light and fluffy. If necessary, gradually add more powdered sugar or whipping cream to reach desired consistency. These sound so dreamy and rich! Gotta love that Nutella! Man that frosting looks so good i just wanna eat it with a spoon for lunch. I've been trying to figure out what to make for my son's bday and I think this is it! Nutella is his new favorite food! Thanks for the great idea! I think I'm going to put a dollop of peanut butter in the middle of the batter and see if that works! Just made this today. And my kids were FIGHTING over them. I chose not to do the frosting since none of us really like it but the cupcake itself was delicious. I've recently become a follower and you have some great recipes. Yum to the cupcake! LOVE the cute cake stand! This look delicious!!! I want to make this cupcakes but please help me with this question... 6 CUPS powdered sugar for the buttercream? Really?? Elizabeth - yes - 6 cups. It makes enough for 30-36 cupcakes depending on how much you put on each cupcake. It actually isn't' overly sweet. can we use Yellow Batter or White Batter as well. ?